The fall season is officially here! Bring on the Pumpkin Spice Lattes and the baked sweets! It's the time of the year that we all love, the holidays! Although we look forward to the holiday season, it's also flu season. Adding something as simple as a smoothie can give your immune system the boost it needs to keep up your holiday spirit in tip-top shape. Here are some quick smoothie recipes and essential ingredients to add to your menu this fall. Ginger is very resourceful when it comes to your general health. Adding a teaspoon of ginger to any meal or smoothie will prevent inflammation. It is a natural pain reliever. Germs won't be an issue for you and your family this fall with this "Influenza Fighting" Smoothie. Be sure to pick up some local honey as it will be an essential ingredient to help with allergies. Give the immune system a kick with the Carrot Apple Ginger Smoothie. This smoothie contains 30 percent of your recommended fiber intake. How can you resist a strawberry banana smoothie? 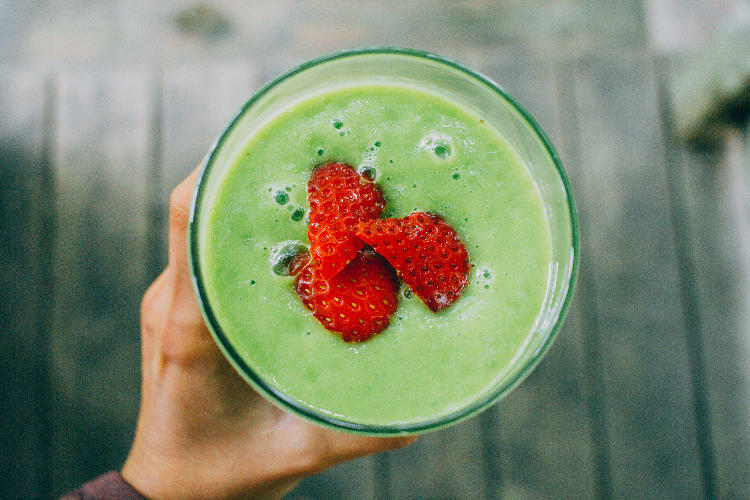 Here is a Strawberry Ginger Zinger Green Smoothie that will give you plenty of Vitamin C.
Get a large dose of Vitamin C when you add leafy greens such as kale, lettuce, and spinach. These greens will also give you a boost in energy, not to mention your daily dose of fiber. Try these amazing smoothies to keep your immune system in tip-top shape. Greens have never tasted so sweet with the Immune Booster Sweet Green Smoothie. Try substituting your morning cup of coffee with this morning pick me upper. Local honey is a great natural sweetener. Try this Super-C Immune-Boosting Smoothie which will help with allergies. Detoxify your body with the Banana Spice Smoothie. The additive cinnamon promotes a healthy brain and will help you stay focused on your next task at hand. Citrus fruits are the best fruits to have. Add any citrus to just about any smoothie for some extra flavor. Get your daily dose of Vitamin C by tossing some oranges, lemons, limes, and grapefruits into your blender. Who knew 147 calories could taste this amazing? The Citrus Energy-Boosting Smoothie only takes 10 minutes to prep and make. This Citrus Smoothie, loaded with Vitamin C, is important when trying to stay healthy during flu season. Starting your morning off with this shake will help your body absorb the minerals you consume throughout the day. Get all the nutrients you need to give your health a boost. With a combination of citrus and healthy fats, the Almond-Orange Smoothie will make your immune system robust enough to withhold anything. Whether it's preparing a healthy smoothie or cooking dinner, be sure to keep your meals rich in vitamins A, B, C, D, and E. Make sure the veggie you prepare for each meal has at least three colors of the rainbow. It is an easy way to make sure that you are consuming all your vitamins. Use websites or apps like Pinterest to come up with great ideas! Show us how your smoothie turns out by posting a picture in the comment section beneath this post on Facebook!